Pink Hobo gallery is currently exhibiting a show of Pinewood Derby art cars. Unfortunately I missed the opening, but it looks like it was a ton of fun, as evidenced by this late night race and this eye-popping portrait. My contribution does not have moving wheels, unfortunately, so it had to sit on the shelf during the race. Or maybe Tim and Curtis threw it around like a football. I don't know. Anyway, playing off the ultra-cheesy theme that every car has a story inside of it, I decided to literally fill my derby car with a stream of consciousness mini comic, which you can read more about in the next paragraph. "A Time to Thrill" is an automobile-themed comic strip I drew on eleven slabs of painted balsa wood. Unfortunately, when I joined all the slabs together to form a car-shaped sculpture, the world lost the ability to actually read the comic. 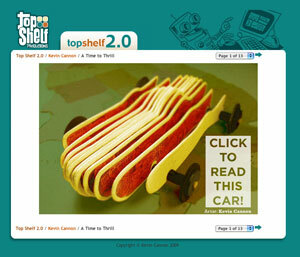 Top Shelf 2.0 -- an online library of awesome mini-comics and serialized comics, updated daily -- has posted the complete comic! Go check it out! And then go check out the actual car at Pink Hobo in NE Minneapolis while the show is still running! Looking at your original photo, I thought you had drawn pictures of the car's guts -- sliced open. Like the car was a living being that you dissected or something. With maybe an engine, springs, nuts, bolts, mufflers and stuff mixed in with the organs and stuff. Eew. HA! I read it on the Top Shelf 2.0 site before it appeared on the BTA site! Very interesting concept and of course an entertaining read. Thanks, guys! David, you're partially right: the color scheme of the sections is meant to look like classic cartoon slabs of steak. I really like your idea about the literal cross-sections of a car. If I knew anything about cars I'd try it! Hey Kevin, is this piece for sale? Doc -- Yeah, the gallery price is $400. yeah that thing is really aerodynamic, you can get a good spin on it and make really long passes.